The Harbison Forest50k was held today in my backyard… literally. I live on the edge of Harbison State Forest, the self-proclaimed largest urban green space in the Southeast. Those of you from actual Metropolitan areas may find the designation quaint. But call it whatever you want. I can roll out of bed and run miles and miles of beautiful and varied trails. I find it difficult to believe that I lived here for half a decade as a non-runner. Wasted years. The race today was the first of the South Carolina Ultra Trail Series. It was held so close to my house, that with creative re-routing, I could have manned an aid station on my front porch. I’ve run back-to-back marathon/ultras before, but I’ve got Boston in eight days. What if I twisted an ankle or broke a nail? So I volunteered for the race today and had a marvelous time. I cheered runners, offered help and directions and generally witnessed others’ suffering while I lollygagged in relative comfort and ease. What will the Maniacs think of me now? If you ran the race, or just want to see people running in my backyard, view and download my photos at Flickr. They’re not too shabby. As a trail runner, I’m not bored by long stretches of featureless road, my feet never ache, and I avoid recklessly inattentive teenagers who drive white pick-up trucks. You should join me on the trails. Off road, you’ll experience varied terrain, often gorgeous scenery, and meet amazing runners who consider scaling wooded mountains an ideal way to spend the day. Ever freak out on the road when you can’t find a convenient restroom? Don’t give it a second though on the trails. Train running offers a much needed respite from the techno-urban tornado. It’s like immersing yourself in those zen-like Alpine Lake or Bavarian Meadow ambient background CDs; just without the CD player, your bathrobe, or your living room. Admittedly, some people aren’t interested in relaxation. They’ve read Lord of the Flies once too often, and prefer to unleash the tribal primitivism of their inner Jack. We all run for different reasons. Anyway, as you run, jump and swerve through the trails, you’ll work more leg muscles than exercised by ordinary road running. You’ll also greatly enhance something called proprioception; your body’s unconscious, non-visual knack for spatial orientation. Sorry, this doesn’t mean you’ll turn into Nostradamus. Trail running has become my passion. I love the switch-backs, single tracks, stream crossings, and mud. I even enjoy tripping over roots and falling on my face. Unsurprisingly, I also enjoy the wildlife. I’ve seen wild turkeys, squabbling raccoons, snakes, quail, foxes, coyotes, skunks, bunnies by the score, more squirrels than I can count, and of course spiders and their ubiquitous webs. I’ve also seen loads of deer. If I had a dollar for every doe, buck, or fawn I’ve seen on the trails, my servants would have written this post for me. It all stands to reason. After all, I regularly cavort through their home. And deer are quite a jumpy lot. When runners come barreling through the trails, the herd scatters haphazardly like teenagers caught at an illicit bottle-spinning party. Deer literally hightail it away from humans. It’s quite a sight – in daylight. But I also run the trails in the dark. Slapping a battery-powered light on your forehead for nighttime trail running is probably as foolish as it sounds. You can’t see anything more than a few feet ahead of your headlamp beam; except the sinister, reflected eyes of wild deer. Yeah, it’s creepy. And I sometimes run alone in the dark. This can be somewhat unnerving, especially if you pause to consider its rank stupidity. But let’s not dwell on that. Recently, on a solo, pre-dawn trail run, I rounded a hairpin turn and was startled by the sudden appearance of two piercing, glowing eyes right in front of me. As I stood frozen in sheer terror, an enormous deer pounced straight up, bayed, and I can’t put this any other way, hissed at me. At that moment, without benefit of calm recognition, I thought I was sushi. I swear it was pretty close to that. I was shaking for several minutes. Fortunately, I think the deer was more scared than me, and that’s saying something. This might not be a rugged bear or cougar story, but encounters with large herbivores are quite enough for me, thanks. But consider the big picture. 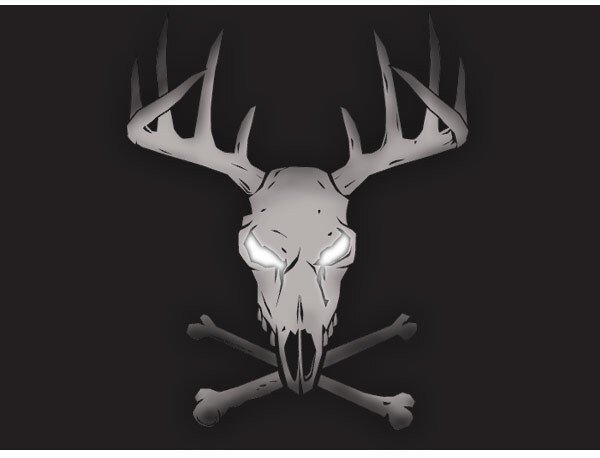 Regardless of the psychological trauma, I’ll take startled venison over close calls with speeding, two-ton vehicles any day of the week. Life in the developed world used to be nasty, brutish and short. People eked out meager existences, dependent on land, vagaries of weather, or whims of monarchs. Beyond war, oppression and occasional ritualistic flagellation, they rarely invented ways to beat themselves into dust. Everyday toil was sufficient. Free time was, put mildly, elusive. The Double Whopper with Cheese was yet a blip on the distant horizon. Today, we’re prosperous beyond the wildest dreams of our progenitors. We have leisure to spare; leisure to invest; leisure to give to the poor. We’ve arrived at the backswing of the pendulum. Fed up with excess relaxation, we actually search out physical pain and mental exhaustion. Thus the running craze. From the great beyond our ancestors are shocked that we pursue the hardship they longed to escape. By hardship, I don’t mean the marathon, or even the ultramarathon. A new deranged category has emerged. Call it the psycho-ultra. Consider Badwater, the jewel of the ultra belt buckle. It’s a 135 mile race from Death Valley to Mount Whitney in the dead heat of July. It’s unbelievably severe. Just watch the documentary and cringe. Yet Badwater may simply be the Barkley Marathons of the West. Held in Tennessee, Barkley gives appalling a new meaning. The 100 mile run consists of five unsupported twenty-mile loops through largely untraveled, highly difficult trails. With a grueling 52,900 feet rise in elevation, the course breaks even elite athletes. Participants must carry a compass and whatever food and drink they can. They have twelve hours to complete each circuit. To prove it, participants must retrieve pages from books along the course. Getting lost is likely, and potentially costly. Anyone missing a cutoff by two hours agrees to pay all search and rescue expenses. Eventually, everyone quits. Well, almost everyone. In twenty-one years, 600 people have attempted Barkley. Over the entire history of this event, a grand total of six people have completed it. I can barely comprehend this. I’m still trying to understand why I run at all, let alone develop a frame of reference for survivalist ordeals. The Washington Post offers an excellent article on the grisly Barkley. You simply must read it. Then, contrast that account with the matter-of-fact style of Barkley’s official site. It states that the race “will leave you a struggling shadow of yourself.” Ah, perhaps that’s the draw; to unravel all layers of the onion to see what’s inside. Our forefathers might understand this sentiment, but for them it was all in a day’s work. 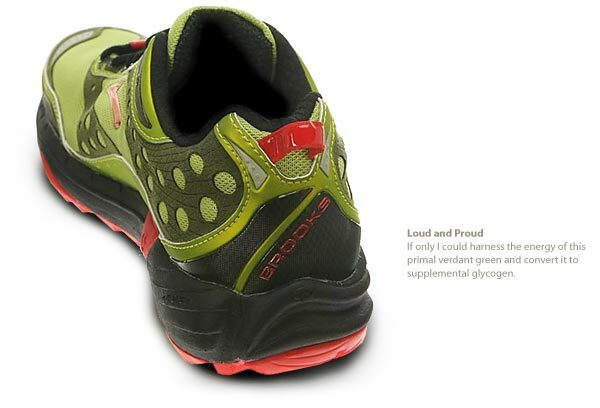 I finally got some new trail shoes, opting to continue my affair with the Brooks Cascadia Pivot. I love this shoe, and not just because it’s colorfully garish. It really hugs the trails and is enormously stable. These shoes are just plain awful on the road, but perfect on the soft stuff. Worn casually during the break-in period, they elicit a lovely array of comments, some clearly not meant to be heard. Honestly, I wish the design were even more bodacious. My pair is more green than the earlier-released chartreuse version, which I would have preferred. Nothing says “trail runner” like loud, obnoxious shoes. At least you’ll be found quickly if you fall off a cliff. Over an hour before the crack of dawn, it’s typically pitch dark. A full moon however, can often provide decent light. Yesterday, the moonlight was astonishingly bright. Everything glowed. My friend and I usaully wear geeky runner headlamps to see in the dark. This time however, such gadgetry was not needed. The gravel road leading to the trails was illuminated powerfully. Long shadows were cast by trees and we could more than easily see our way. Around one bend, the sky was utterly dominated by the moon. The road was positively showered with light. We had to squint. The moon recedes from the earth at a rate of four centimeters per year. It’s getting farther away all the time. You could hardly have convinced me of that me of that yesterday. How could we resort to headlamps once the road gave way to the darker trails? Artificial light would sully this sublime experience. We’d lose the beauty of the moment by polluting it with our high tech presence. Reluctantly, we lit up and entered the trails. Twenty yards in, I thought better of it and turned off my headlamp. It was quite dark, but the ambient moonlight made the trails navigable. I instantly felt at peace with the run; at peace with myself. The moonlight filled the quiet, pre-dawn trails with something like a still reverence. I ran feeling distinctly alive, enjoying the trails as perhaps I never have. Running felt easy, carefree, effortless. Potentially breaking my face on a dark trail seemed a small price to pay. I bristled at the thought of sunrise. My only regret was that I didn’t wake up earlier and run longer. I prefer sardonic wit to reflective prose, but I’ve got nothing ironic to offer about this run. On Wednesday morning, the moon shone, and I enjoyed it immensely while it lasted.